Patent-pending fluid & sound technology enhances the flavor, taste and aroma of all beer styles, including IPAs, Pilsners, Stouts, Porters, Lagers, etc. Fizzics Waytap does not require any CO2 or Nitro cartridges, proprietary replacement parts, or ongoing refills to operate. Skip the trip to the pub with Waytap. No longer are expertly poured draft beers exclusive to high-end craft beer bars. The Fizzics Waytap™ System allows beer aficionados and novices alike to pour expert draft-quality beer from just about any can or bottle. Engineered using Fizzics Micro-Foam technology to unlock the full taste of authentic draft beer, Waytap enhances your beer's aroma and delivers the freshest full-bodied flavor possible. It's compatible with 12-25oz cans and 12oz bottles so you can share and enjoy the true taste of beer the way the brewers intended, whenever and wherever you want. What is Micro-Foam Technology, you ask? Fizzics Micro-Foam Technology leverages fluid dynamics and sound. 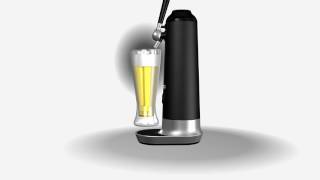 Place a can or bottle of beer into the Waytap system, pull the handle forward to pour the beer under pressure at a controlled rate to maintain the carbonation within the body of the beer. Push the handle backward to begin the “sonication process,” applying sound waves to control the process of converting the beer’s natural carbonation into an ideal Micro-Foam, comprised of uniformly sized bubbles with the perfect density that delivers enhanced aroma, flavor, and mouth-feel. That fresh-from-the-tap taste you love—anytime you like. Expensive or cheap, Ale or Porter—Fizzics Waytap works great with all styles of carbonated beer. 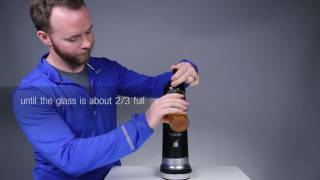 Running on just 4 AA batteries, Fizzics Waytap is the most compact and portable way to help beer lovers discover the magic behind every variety of beer by improving the body, texture, and concentration of aromatics in all of your favorite brews, including IPAs, Hefeweizens, Pilsners, Brown Ales, Lagers, Stouts, and more. Q: Why is foam important? A: Foam is an integral part of beer quality and the overall beer-drinking experience. Foam is visually appealing, enhances the aroma, flavor & mouthfeel of beer and is expected by all serious beer drinkers. Q: How does Waytap compare to other draft beer dispensers or Kegerators? A: Most all beer systems are powered by a set of equipment (keg, faucet handle, tower, regulator, beer & air lines, CO2 and nitrogen tanks) that must work together for a successful pour. Waytap™ is a compact, personal system that utilizes the inherent properties of conditioned and commercially packaged beer. This, coupled with our patented technology, controls the pressure of CO2 that wants to come out of solution and influence both foam generation and beer head retention. Q: How do you clean Waytap? A: Cleaning Waytap™ is very easy. Run a glass of warm water to flush out the system. The lid can be removed to easily clean the inside of the system. The anti-microbial drip mat separates for easy rinsing and washing. Q: Should I hold my glass a certain way when pouring? A: Tap the handle forward while holding the glass at a 45-degree angle, up to the spout of Waytap™ and begin the pour. When you are ready for the head (foam), hold the glass upright and push the handle backwards to top with the Fizzics™ Micro-Foam™. Q: What's special about a beer poured from Waytap? A: Waytap™ provides an enhanced aroma, flavor and taste as well as a smooth & creamy mouthfeel. Waytap™ is scientifically engineered, using patent-pending fluid & gas technology to create an ultra-dense, long-lasting foam head. The technology that went into Waytap™ is both highly complex and strikingly simple. Waytap™ is easy to operate, portable and provides for an enhanced, balanced and sensational mouthfeel. Q: Are the materials in Waytap FDA approved? A: Yes. All components are manufactured, assembled and packaged in a positive pressure Class 100 Clean Room environment that is regularly subjected to rigorous testing in order to meet the stringent requirements of the FDA. All resins are FDA approved food-grade materials and assembled using stainless steel hardware. Waytap™ is designed to comply with FDA, FCC, CE and RoHS standards and regulations.